The majority of immigrants settle in cities when they arrive, and few can deny the dynamic influence migration has on cities. However, a "one-size-fits-all" approach cannot describe the activities and settlement patterns of immigrants in contemporary cities. The communities in which immigrants live and the jobs and businesses where they earn their living have become increasingly diversified. 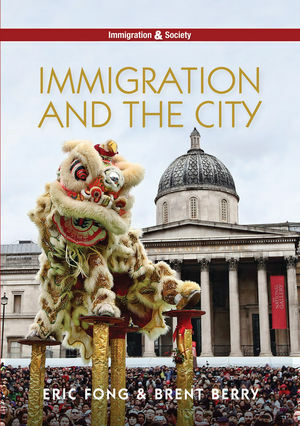 In this insightful book, Eric Fong and Brent Berry describe both contemporary patterns of immigration and the urban context in order to understand the social and economic lives of immigrants in the city. By exploring topics such as residential patterns, community form, and cultural influences, this book provides a broader understanding of how newcomers adapt to city life, while also reshaping its very fabric. This comprehensive and engaging book will be an invaluable text for students and scholars of immigration, race, ethnicity, and urban studies. Eric Fong is Professor and Chair of the Department of Sociology and Director of the Research Centre on Migration and Mobility at the Chinese University of Hong Kong. Brent Berry is Associate Professor of Sociology at the University of Toronto. "Fong and Berry examine immigrants in the United States and Canada to give us a sweeping overview of the diverse experiences of immigrants in cities, mapping the ways immigrants shape the contours of cities and cities define immigrant experiences. This book is a necessary resource to anyone interested in immigration and urban studies." "Immigration and the City provides an illuminating and comprehensive portrait of how immigrants are being incorporated in cities in the United States and Canada, and how the immigrants and their children are, in turn, transforming the urban landscape in these two countries. The book offers a strong theoretical base from which to understand these processes and the social and economic forces that shape them."